Marriage is a sacred union between two people who love each other. 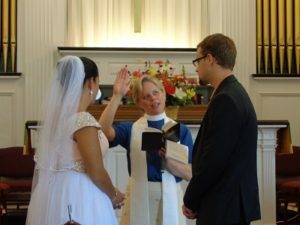 At the Congregational Church of Hollis, we believe that God blesses all committed, covenanted loving unions, and our celebration of marriage is open to all. Rev. Tanya typically meets with couples wishing to celebrate Christian marriage several times for 60-90 minutes each time, in order to explore issues of marriage and to plan a ceremony that expresses the covenant you are making with each other, with God, and with your community. The wedding ceremony is an act of worship. By placing marriage within the framework of the church’s worship, a civil act is thereby filled with religious meaning. And by careful preparation, your wedding day — and your marriage — can be a creative and joyful event as you stand together before God, aware of and seeking God’s will throughout your lives. To that end, the church offers its support, its concern, and its blessing. Contact the Church Adminstrator at churchoffice@hollischurch.org to set the wedding date. For more information, download the Wedding Information Form.